The Almar Group has been providing the construction industry with washroom products and services since the 1980’s. The Duracube division was started in 2012 when the owners saw a need in the market for a superior toilet cubicle range which can be utilised in a range of facilities such as Council owned buildings, Education spaces, Corporate offices, Leisure centres, Hospitality and Public Spaces. We work with Architects, Designers and Builders Custom Design their Washrooms. Contact Us today to discuss your Toilet and Shower cubicle needs! At Duracube we provide our clients with durable, robust and practical 13mm Compact Laminate Toilet and Shower Partitions systems. We also have a full range of custom made bathroom/wet area products such as Bench Seating, Lockers, Privacy Panels and Vanities than can be combined with our Partition systems to transform your wet area. Our main objective is to provide our clients with High Quality Toilet Partitions for Airports, Change Rooms, End of Journey Facilities, Commercial Washrooms, Public and Private Schools, Aquatic Centres, Locker Rooms, Fitness Centres and much more to further enhance the experience of the users. Our Durasafe 13mm compact laminate is stocked and machined in our factory in Sydney, custom made to you specific needs and is shipped Australia wide ready for installation. Custom made to the specific needs of your Amenity and washroom design, Our unique range of colours includes matt, gloss, and ‘Raw Oak’ our textured Woodgrain complementing any Amenity and washroom designs. We foster and rely on repeat business and are proud of our growing customer base covering all areas in Victoria, New South Wales, Australian Capital Territory, Tasmania and Queensland. With installation services in Sydney Metro, Regional NSW, Canberra, Brisbane, Melbourne and Adelaide. 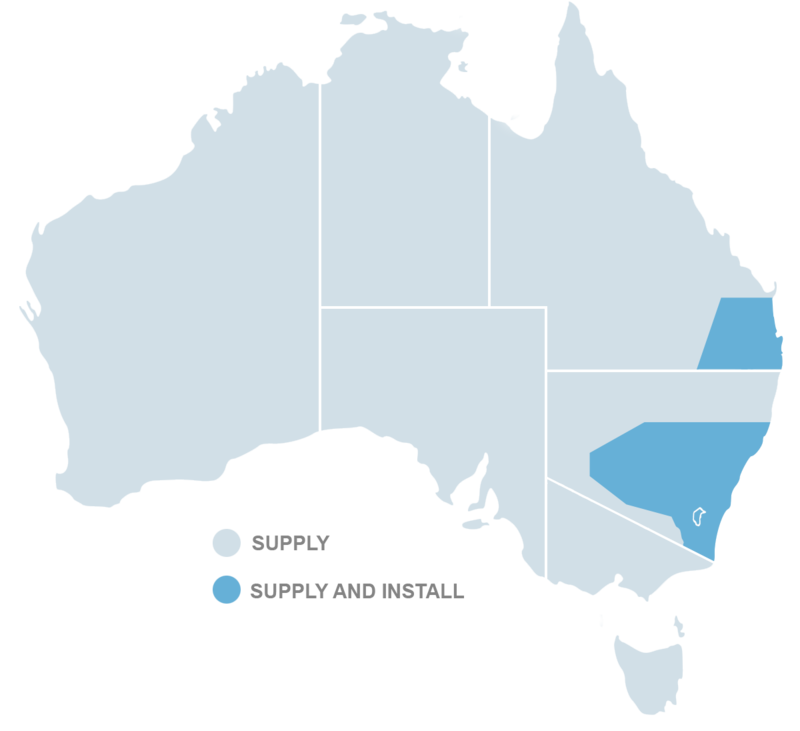 We have a network of distributors providing installations in Regional Queensland, Victoria and South Australia. Currently located in the following locations and is growing. Adelaide, Mt Gambier, Shepperton, Bendigo, Albury, Wagga, Dubbo, Newcastle, Port Macquarie, Coffs Harbour, Ballina, Gold Coast, Toowoomba, Sunshine Coast, Hervey Bay, Bundaberg, Gladstone, Rockhampton, Mckay, Townsville, Cairns. We also supply ready to install flat pack toilet cubicle/washroom joinery kits to these areas.